What a great pic to start the day with…. She’s pure , beautiful and happy. And those eyes…. You did it again ! Wow. who wants to go home after a trip like this???? great chemistry .. very cute photo! Thank you for the wonderful picture. Being a Nepali myself, I am really thankful for your work as I am currently away from Nepal. I just want to point out a simple error you made while writing the caption of the image.The caption "Hindi Girl" is not correct as it means a girl from India or moreover "Hindi" is the name of Indian language.It should be "Hindu Girl" which you have written in the comment also. Thank you. Excellent expression & colors ! wonderfull photo with great expressions. 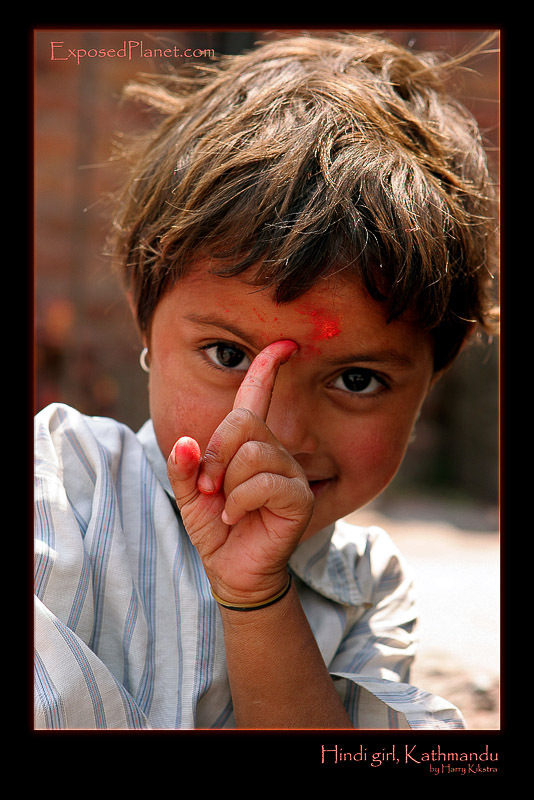 The story behind "Hindu Girl in Kathmandu"
Pashupatinath is the holiest Hindu place in Nepal. This is where the cremations take place, just hours after the deceased have passed away. Different places for different castes, it is a coming and going of groups of relatives who burn their loved ones, after which the ashes are thrown into the holy river. But the complex is not just for cremations, it is huge with many different temples, shrines and nice places. A few children were playing and this little girl turned to me to indicate her red dot, not being afraid of my white face or my camera. She was just happy and played along with her friends. This is still one of the images I check when I am feeling down as it makes me smile again. Update; ‘Hindi’ in the title changed into ‘Hindu’ (not on the image), thanks to a nice comment from Niraj, thanks!